Thunderbolt & Mini DP Look Like Twins. Can I use A on B? In this article we will explore the connectivity between Thunderbolt and Mini DP. This confuses many buyers because they look so much like twins. As we, wavertec, are specialized on adapters. We would like to explain a few before start. If you are considering to buy cables for your MacBook with Thunderbolt to a display, the Mini DP cables will be compatible. For example, Mini DP to HDMI or to VGA or to others, they will works well on your MacBook Thunderbolt. Thunderbolt display is a type of technology which combines peripherals like audio, data, video, storage devices, monitors and power into a single connection. Thunderbolt uses a combination of the Mini DisplayPort with PCI Express serial connection. Thunderbolt was developed by Intel in corporation with Apple for use in the MacBook. It was previously known as light-peak named during its development process by Intel. Mini DisplayPort display is a digital connection used to connect external displays by providing a plug and play type of performance by driving display devices with VGA, HDMI and DVI interfaces. The Mini DP display is used both in MacBook and Windows PC / notebooks. The Thunderbolt in MacBook uses an active data technology while the Mini DP uses a passive technology. The Thunderbolt is active meaning, it can convert a signal from one connector to another to enable it to transfer data fully and integrates with different types of ports. Mini DP passive transfer technology means that it only allows audio, video and data to pass to the connected ports and cannot convert a signal from one connector to another (unless there is an adapter between for convertion e.g. Mini DP to HDMI signal) reducing block-chain inter-connectivity. This is the same type of technology used by Windows PC using the passive technology for Mini DP. The Mini DP is not forward compatible therefore it cannot be connected to a Thunderbolt devices, e.g. display, as it will not work despite having similar kind of connection. This is because the Mini DP port connected to the Thunderbolt devices in any new MacBook will not produce the required output as only a single chain will have been formed. In older Apple's MacBook, the Mini DP can be used to connected to another MacBook. This is because one MacBook act as an input device while the other one acts as an output device. However, in MacBook that are Thunderbolt enabled devices, this type of connection is impossible, as a user cannot be able to use a recent MacBook Screen (Thunderbolt display mode) to connect to an old MacBook (port type Mini DP). But the user can use an old MacBook Screen (Mini DP display mode) to connect to a recent MacBook (port type Thunderbolt). This is due to compatibility difference between a non-Thunderbolt device lacking a Thunderbolt display capability with a device having the Thunderbolt display technology in its cable hardware. However, the vice versa works. A MacBook containing a Thunderbolt connection is faster due to the PCI Express which provides high-speed connection to components on a user's MacBook. Due to the fact that Thunderbolt uses PCI Express signals, it allows a direct connection to the buses on the PCI Express. Thunderbolt displays are bi-directional meaning that they can receive and transmit data, video and audio simultaneously offering up-to 10 Gigabytes per second of data transfer. This makes Thunderbolt devices more preferable compared to Mini DP display in any MacBook or Windows PC due to their lack of PCI Express. 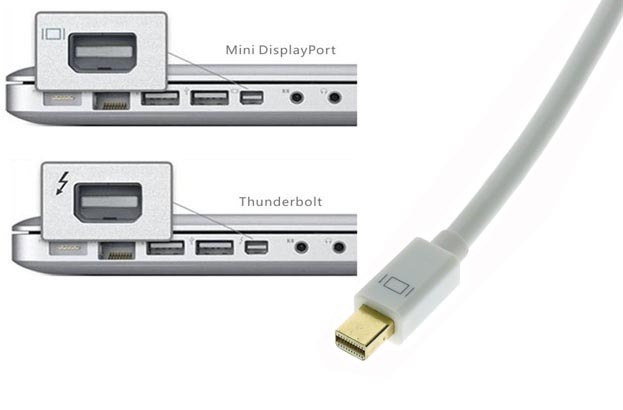 They use the same type of connector on any MacBook hardware, meaning that the Mini DP display runs on the Thunderbolt port. A Thunderbolt connector will work when connected to a Mini DP display despite not having a Mini DP port work on connected to a Thunderbolt Display. This only requires users to take caution on the connections to avoid any confusions between the connectors. Copyright @wavertec. All Rights Reserved.